Well received in the region ... Axor One (left) and Axor Montreux. Hansgrohe Middle East’s two recently launched products – Axor Montreux and Axor One – have been hugely successful in the region, says a company spokesman. Axor One is an all-in-one thermostat module for minimalists. Created by London designers Edward Barber and Jay Osgerby, the module for the shower creates a new feeling of spaciousness due to its simplicity, flatness and size. It features generously proportioned paddles, and is flat and gently rounded. All functions are concentrated in one central control unit. 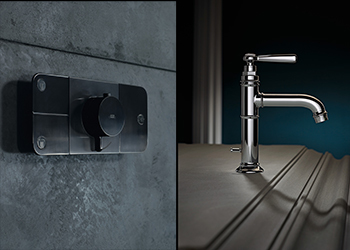 The Axor Montreux on the other hand is a bath and kitchen collection created by Axor and Stuttgart-based Phoenix Design Studio in the style of the first industrially manufactured fittings. “With authentic forms and defining design features of the early 20th century, Axor Montreux is an iconic collection that stylistically reflects on a time of scientific and cultural change. Functionally, it delivers the highest qualitative standards and acknowledges the technological advancements of the age,” says the company spokesman. From the very first wall bar, to multi-jet showering enjoyment at the touch of a button, German luxury fittings specialist Hansgrohe has been shaping the bathroom landscape since 1901. Boasting 34 companies and 22 sales offices all over the world, the company enjoys a global reputation with the “Made in Germany” quality stamp. Along with its design brand Axor, Hansgrohe is a leader in quality, innovation, and design.